Hockey Victoria have determined that the match format for the following grades will be quarters in 2019. The introduction of the quarters format sees a total of 77 minutes required for match time in a 90-minute time slot. It is the clubs, coaches and players responsibility to work with appointed officials to ensure games both commence on time and return from breaks on time. “Kicking backs” will no longer be allowed. Teams have now two options: they either play with a goalkeeper who wears full protective equipment comprising at least headgear, leg guards, kickers and hand protectors, or they play with only field players. 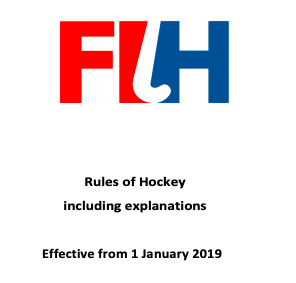 It is hoped that this experimental rule will enhance safety as field players will no longer have goalkeeping privileges so will not be entitled to use their body to stop shots at goal. Players other than the attacker taking the free hit must be at least five meters away, including when they are in their circle. If the attacker however chooses to take the free hit immediately, then defenders who are inside the circle and within five meters from the ball may shadow around the inside of the circle as per the explanation of the rule before 2019. The option that a penalty corner is completed when the ball travels outside the circle for the second time has been removed from the rule book. Aerial Balls and Guidance for 2019 to Umpires. Part of Hockey is about evolving our game to make it more dynamic and exciting to attract future participants and create more exciting passages of play. One skill that has seen increased usage over the past few years, is the use of 3D space and Aerial play. In previous years Umpires have been instructed to blow the whistle based on a very black and white version of rule 9.10. This has seen the flow of the game to be interfered with and has created situations where a player’s skill has been “punished” by them having to stop the ball before playing on. This has led to frustration and increased conflict on the field. As we would have seen in the recent Champions league games, players are not necessarily being penalised for being within the 5 meters when a player is receiving an aerial ball. The players have been allowed to use their skill to play the ball and play was seen to be more organic. We wish to capture these moments in the game and help facilitate the game for the players and spectators. With the above in mind, our intention is that our umpires will be looking to develop their skills at allowing more of these exciting skilful plays and penalising when true danger exists for the players. We expect that the teams will continue what they have been doing in respect for playing the ball and using common sense. We won’t allow swinging sticks or baseball type swings and if these are carried out near people, they could attract a further penalty. This will mean that players that may be 4 –5 meters away from a player and not engaging until the player has brought the ball to a controlled position may not be penalised and still be allowed to in turn, to play the ball with skill should the other player be unsuccessful, or a player that runs 4–5 metres in front of a player receiving an aerial and manages to pick the ball out of the air without causing danger, should be allowed to play on. We know that this will be an education that won’t instantaneously happen and we hope that the teams are patient with this process. We are on the same journey, we want to improve the game for all participants and if we can please remind the players that we, like them, are evolving to this great game of ours called Hockey!